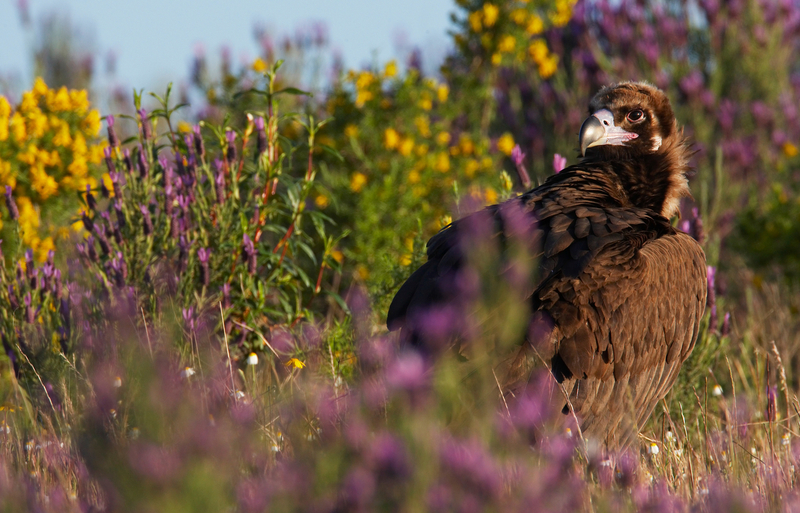 Black Vulture (Aegyptus monacha), classified as Near Threatened (NT) on the IUCN Red List. The Life – Vultures project, kicked off this February, was now presented to the Bulgarian public, local communities and national media at the official opening ceremony that was part of several events marking the Haskovo Town Day and the International Vulture Awareness Day. Various ongoing and planned activities of the project which started this February, and will last for the upcoming five years, were presented by the core project team and partners. 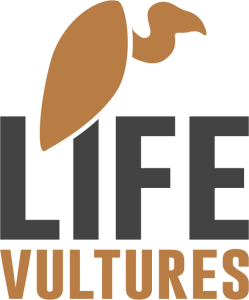 The LIFE Vultures project was developed by Rewilding Europe in partnership with Rewilding Rhodopes Foundation, Bulgarian Society for the Protection of Birds/Birdlife Bulgaria, WWF Greece, Vulture Conservation Foundation and Hellenic Ornithological Society/BirdLife Greece. Presentation of the Life Vultures project at the opening ceremony in Haskovo, Bulgaria. The guests were intrigued by the innovative activities of the project, especially with the training of the special anti-poison dog unit. After a nearly two-month-long sniffer dog training in Hungary this summer, the dog unit will return to Bulgaria ready and set to detect poisoned animals and thus prevent the poisoning of rare birds. Another exciting aspect of the project, well received by the public, is the reintroduction of red and fallow deer in the Rhodope Mountains rewilding area where they have been extinct for decades. Special guests at the event were representatives of Madjarovo Municipality, one of the projects priority areas. “The municipality is ready and willing to support wildlife conservation, rewilding and tourism development in the area. We have always supported these ideas and wish the project team success in all the activities.” said Tatiana Stoyanova from the Municipality. Elzbieta Kret from WWF Greece presented their experience in protecting black and griffon vultures in Greece, as well as the expected results from the project in the next five years. During the press conference, Elzbieta also explained that Dadia National park, a focus area of the project, is one of the last remaining “strongholds” of the black vulture and the only place in the Balkans where people can actually see these amazing birds. Here, the ongoing conservation work and the preservation of the typical mosaic landscape covering the trans-border area is crucial for the survival of the species. Volen Arkumarev from BSPB continued and presented the main threats and challenges for the survival of the species. Opportunities for wildlife entrepreneurship in the area were also discussed during the press conference. Four wildlife watching hides will be constructed or modernized. “This will help the area to become a attractive destination among nature lovers photographers, and we hope will boost the development of nature based tourism in the region”, said Stefan Avramov, projects rewilding officer. Children learning about vultures and nature conservation with BSPB volunteers. 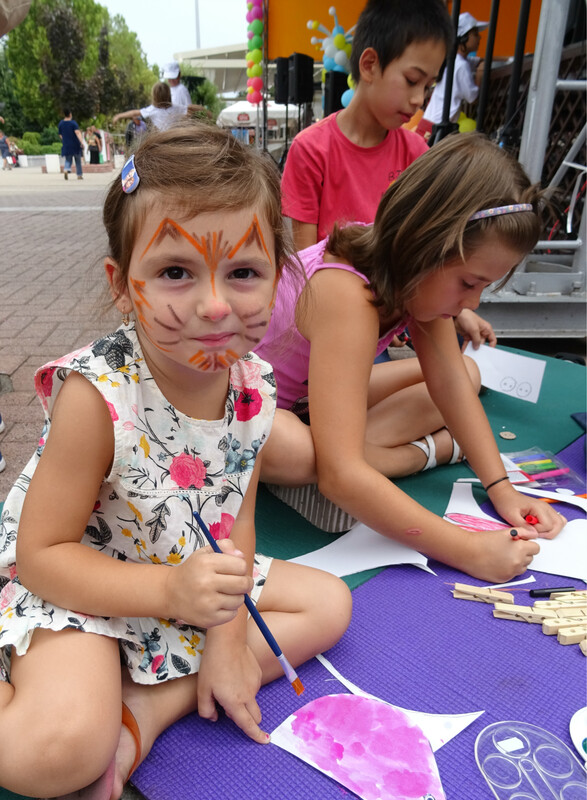 During the Haskovo town days a number of educational and entertaining activities for visitors and children took place, organized by the Bulgarian Society for the Protection of Birds, one of project partners. Volunteers painted the faces of children, masking them to look like griffon, Egyptian or black vultures. The youngest guests also had the opportunity to ‘turn into’ a vulture – by taking a picture with the photographic panels “I am a Griffon Vulture” and “I’m a Black Vulture”, designed especially for this occasion. The day was special for all the young bird-lovers and future ornithologists. Right after the press conference, the children and their parents enjoyed the screening of the amazing popular science film about wild birds in Bulgaria “Flying away”. Children also learned interesting facts about vultures and now know that the wingspan of the black vulture reaches 2.5 to 3 meters and when landed reaches a height of more than a meter. To find out more about the project and follow the ongoing activities visit the project web page.